Song of Susannah | What I think About When I Think About Writing. ← On This Day…18 August. It was late last night (or early this morning, actually) when I put down Wolves of the Calla, the fifth volume of Stephen King’s Dark Tower series. I have to be honest, I didn’t know what to expect from this book. On first glance it appeared to be “filler” material, a sub-plot taken to its extreme, a ploy to get another book squeezed in there somewhere. My initial impression was that this was a needless side-step from the quest: The Magnificent Seven meets Little House on the Prairie. As usual, I was wrong. Not only is this volume necessary to the ongoing plot of the series, when you take into account character arcs and development, it’s also a rip-roaring adventure story. The Gunslingers ride into town and save the local townsfolk from marauders. Cue Elmer Bernstein’s theme tune. But it is so much more than that. As a friend recently pointed out, Wolves is stuffed to the gills with pop-culture references. Vampires are all the rage at the moment, but we tend to forget where they came from. Stephen King’s second novel, Salem’s Lot, was among the first to put a modern spin on them. He made them terrifying again. One of his characters from that novel, Father Donald Callahan, is a major character in Wolves, and to be honest with you, I wasn’t really sure if that was going to work. Too much postmodernist play-acting. A writer losing control of his focus. Those thoughts were prevalent in my initial reading of Wolves. But it all makes wonderful sense. Of course it does – it’s Stephen King, after all. This is his universe; these are his creations. If the author can’t play around with his own characters, who can? Once again, I’m not going to spoil what happens for those of you who haven’t read the series. You have to experience it for yourself. The one thing I will say is, I got this book. I took every idea, every concept that King created and went with it. It’s a journey I’m very much enjoying. 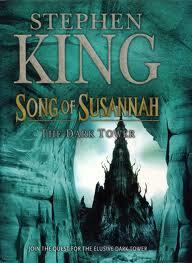 So much so that when I finished Wolves, I immediately headed straight to Song of Susannah. If any of you out there have all seven books, ready and waiting, that’s how I suggest you do it: read one after the other. How in the hell did his readers wait all that time to finish the series? I know I couldn’t have coped. This entry was posted in Books, Reviews and tagged Arts, Elmer Bernstein, Fiction, Online Writing, Roland Deschain, Shopping, Stephen King, The Dark Tower V: Wolves of the Calla, The Dark Tower VI: Song of Susannah, The Dark Tower VII: The Dark Tower. Bookmark the permalink. I don’t know how people made it through with the wait time in between! I read the first one and loved it- so I returned to the library ready for book two, only to find it had yet to be released. I was SO annoyed I didn’t pick up another collection for YEARS! Not my kind of book, but you do make me curious enough to have a peek if I chance upon it.